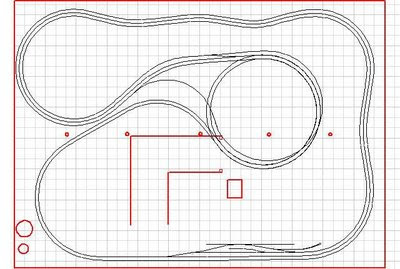 This is the track plan that I am building. It's around the walls of an approx. 26'x36' basement. The items in red are fixed obstacles in the basement: water heater, water tank, furnace, posts and the large 'L' shaped structure is the stairs. The plan was drawn in 3rd PlanIt. Minimum radius is 64". It's supposed to represent the B&O West End with M&K Junction at the bottom of this picture, with the Cranberry Grade (with three tracks) proceeding to the east by B&O timetable (right in this picture) and the Cheat River grade (with two tracks) going west by B&O timetable (left on this diagram). the Cheat and Cranberry grade enter the 2-turn helix at bottom and top respectively and the helix serves as serial staging. Ignore the yard-like arrangement in the lower center, it was totally changed during construction. Currently the track along the Bottom and right walls is built and I am working on the bench work in front of the water heater, lower left. We moved into our current house in April 2006. The house did not have a garage and I had to find place for all of the 'stuff' that you accumulate. Unfortunately our new town was very difficult about building permits and was not making it easy to put up a garage. So I put up a couple of sheds instead to house all of the garden junk and household storage. This task took me until November of 2006. Once the basement was clear to the point that there was room to work that did not clear the way for layout construction to begin. The basement was, indeed, unfinished. Bare concrete walls and floor and four single-bulb light fixtures. I had to finish framing the inside of the basement windows which were left oozing expanding foam. Then I painted the walls and floor to seal the concrete dust. 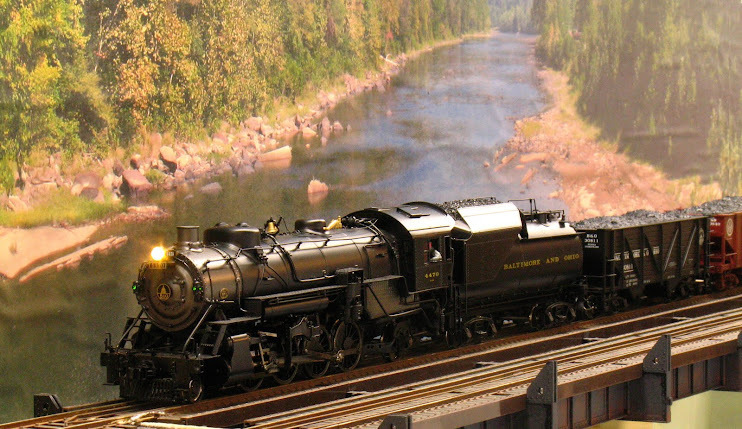 The stairwell to the basement was a mess as well, so I finished that off to house the collection of railroad memorabilia that you accumulate over the years. I also installed some two-bulb florescent fixtures to alleviate the gloom. Things were looking up, but all of this pre-layout construction work took me almost a year to accomplish. The plan is really interesting. Your MOAH is in the absolutely perfect location...at the end of a peninsula so that you are using the space anyway. I am going to have to remember that when I get around to building my layout.